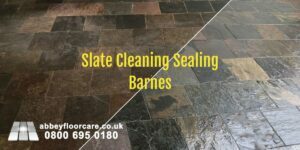 If you are wondering how to clean and seal a slate floor, you have landed at the right place. 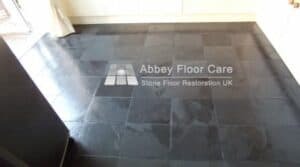 My minimum daily charge for slate cleaning makes cleaning small slate floors quite costly. Over the years, I have helped a number of people to do small floors themselves. 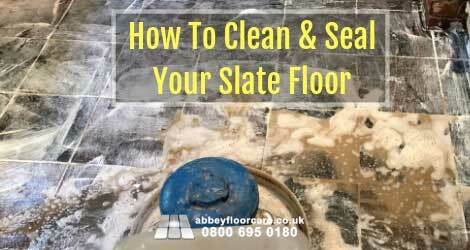 So, I decided to publish the advice on my blog as a reference for anyone who wants to try cleaning and sealing slate themselves. 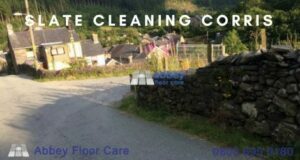 There are many cleaners and sealers available. I have decided to use LTP products for this guide because they are good quality products and available throughout the country from Tile Giant stores, or online from LTP themselves or other suppliers. If you have the desire, your knees and arms are OK, you can do the work yourself. I reckon 5 square metres is as much as a normal person will want to attempt. However, if you are particularly motivated, enjoy kneeling a lot, hard work and aching shoulders, then you can go as large as you want. So here we go. I have added links to the cleaners, sealers and some equipment that is not readily available in the home. Remove all furniture, free-standing items and removable kitchen kick boards from the room. Put on your gloves, goggles and knee pads. Always add chemicals to the water. Never add water to the chemicals, because the water can splash the chemicals out o the bucket onto your skin. LTP Solvex settles and separates after it has stood for only a few hours. So, before you open the container, give it a good shake to fully mix the components into a creamy consistency. Apply the Solvex to 1 or 2 square metres maximum of the floor. As a rule of thumb, only apply the Solvex as far as you can reach on your knees. The Solvex needs tome to be absorbed into the old sealer and make it soft. Use a sponge to wet out the Solvex. Use a black scrubbing pad to scrub the surface and remove the old sealer from the tile. Use the grout brush to scrub the grout to remove the old sealer. Ideally, use a wet vac to vacuum away the slurry. If you don’t have a wet vacuum, then use a mop and bucket, or sponge and cloth. If there are layers of old sealer on your floor, you may need to repeat the process a number of times to remove all traces of the old sealer. Once you have removed all of the old Sealer from the tiles and grout, you can remove the masking tape and put it straight into a black bag for disposal. Clean and remove all cleaning materials and equipment to a safe place. Some grout can be very porous, so it is better to leave your floor overnight, or even a couple of nights to dry ready for sealing. If you are going to leave the floor with an Impregnating Sealer finish or you are going to apply a wax finish, you need to apply two or three coats of impregnating sealer. Gather your sealing chemicals and equipment to a safe place, as close to the work area as possible. Start at the far end of the room away from the door. Pour around a tablespoon of sealer onto the floor and massage it into the surface of the tiles and grout with a microfiber cloth, working on 1 square metre at a time. Work backwards to the door until the floor has been sealed. Do not allow the sealer to pool in the crevices. If there is any wet sealer remaining on the floor after 20 minutes, wipe it off with a clean dry cloth. Wait for the Sealer to dry for 30 minutes to an hour. Pour around a tablespoon of Surface Sealer onto the floor and massage it into the surface of the tiles and grout with a microfiber cloth, working on 1 square metre at a time. If the wet sealer looks milky, it is too thick, so spread it out more. Working in approximately half a square metre squares, apply a thin coat of wax with the applicator cloth. Immediately buff to a low sheen with a clean buffing cloth. Continue until the floor has been waxed. If after studying this guide, you prefer to call in Professional help, please don’t hesitate to use my simple contact form, I will be happy to help.